YYZ Bambina: Skwooshi is mess-free, creative fun! Skwooshi is a LOT of fun. It is a mess-free, odour-free, wheat-and gluten-free, creative dough. From Irwin Toy, Skwooshi comes in 10 fun colours and individual packs as well as larger sets for maximum creativity. It never dries out and you can mould it in to shapes quite easily. My daughter LOVES it and so do I. My brother was over a few days ago and we were almost playing with it for over an hour! I love that it never dries out, even though there are great containers to store Skwooshi in (which double as texture mouldings). For the most part, it stays together. A few tiny pieces have come apart when my daughter has played with it, but it is very easy to peel off clothing and hardwood floors. She mostly likes to pull it apart and poke holes in it, but I'm sure when she's older she'll enjoy the rocket ship mould as much as I do! 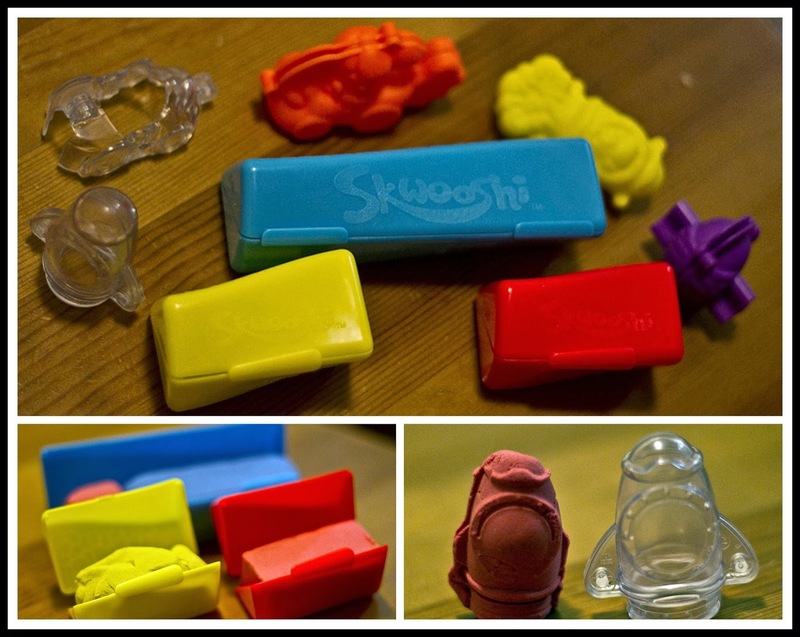 For great contests and neat creations, be sure to like the Skwooshi Facebook page. How do you play creatively with your kids? Disclosure: I received Skwooshi for the purpose of this review. As always, all opinions are my own.